As a child I heard my grandmother recite this poem often, especially when autumn leaves began to appear. Grandmother had memorized the words in grammar school and even in her 80’s, she could still repeat it word for word. She loved poetry and passed that love to me. I like the rhythm and musical flow of words that rhyme and conjure up images in my mind. And when I read “Come Little Leaves” I can see all those fabulous and glorious red, gold, and orange leaves on the trees and in the air as they begin to flutter toward the ground. Then add to those colors the vibrant hues of pumpkins, goldenrod, and mums, and all you can say is “October is one magnificent, colorful month.” So for me, October is COLOR….and plenty of it! Needless to say, this poem always reminds me of October and my Grandmother, who was kindness personified. I do not recall EVER hearing her say or do anything unkind. She truly exhibited this “fruit of the Spirit” in her life consistently. In today’s self-centered world I often find kindness a rarity. It is certainly not something we are born with; we learn it by being taught and by observing the kind acts of others. The Bible tells us to “be ye kind one to another, tenderhearted, forgiving one another, even as God for Christ’s sake hath forgiven you.” (Ephesians 4:32 KJV) How thankful I am that our Heavenly Father is kind and forgiving….and I should follow His example in my treatment of others. 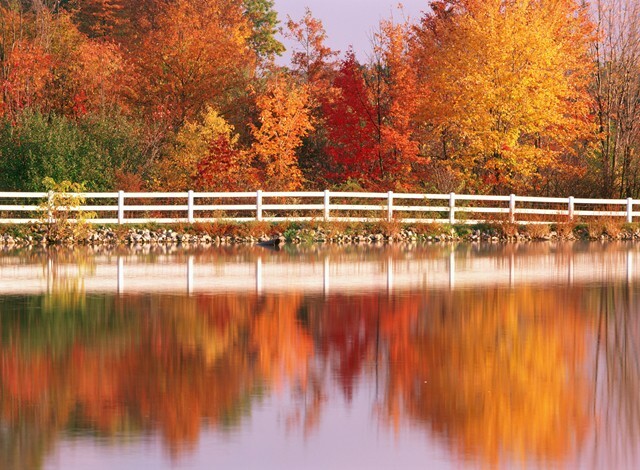 With one stroke of His paintbrush, God transforms the world into breathtaking October color. May you enjoy His handiwork this month. Take time to recognize someone who is (or has been) an example of kindness in your life, and each day LOOK for an opportunity to extend some kindness (no matter how small an act) to another—even a stranger. (c) 2012 Leslie Kelley. All rights reserved.